Once you've invested in fabulous tiles for your bathroom, you'll want to keep them looking at their best - so here are our top tips on how to clean bathroom tiles. First of all, it depends on the type of tiles you have in your bathroom, as a sealed and polished surface is likely to be much easier to clean, and much more resistant to cleaning chemicals and solvents, than an exposed natural stone surface. That does not mean stone is difficult to take care of - it just means you should look after natural stone as you go along, rather than coming back to clean it after any discolouration has had a chance to set in. For natural surfaces, simply wipe away any excess moisture, soap scum and so on; you might not be able to totally dry the tile, but by ensuring it is uniformly damp, you avoid the risk of leaving a 'tide mark' on its surface. In general, there are not many substances that are likely to be present in a bathroom on a day-to-day basis that should leave a stain, and obviously you should be especially cautious if using at-home hair dye and other such products, as these will leave a stain on any surface that will be hard to shift. Plenty of places offer tips on how to clean bathroom tiles using vinegar - just water it down so it is not too acidic, and use clear spirit vinegar, not brown malt vinegar! A half-and-half mixture is often recommended if you want to use vinegar to remove soap or mildew, but be very careful not to mix it with bleach, as this may trigger a harmful chemical reaction. Finally, adopt everyday practices that will keep your tiles cleaner for longer - keep your bathroom well aired and low in humidity, simply by opening the window or door during and after a bath or shower. 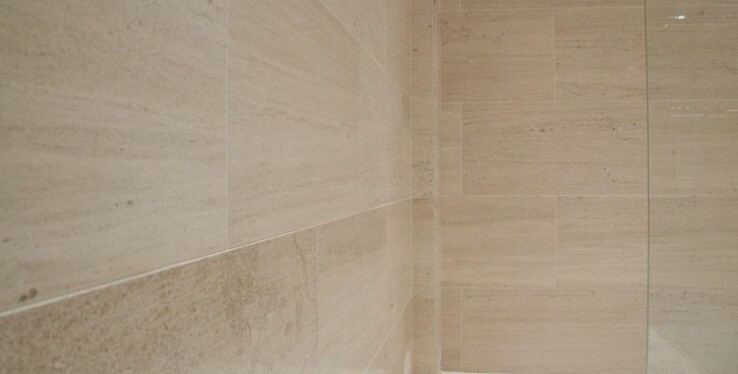 Some cleaners even suggest spraying a fine mist of spirit vinegar on to the tiles to inhibit mildew growth - again, you should be careful this will not damage the surface, but on the right tiles it might be worth it.